The forested slopes of Kunisaki peninsula of Kyushu have samurai castles, Buddhist temples, and rugged volcanic nature to reveal. Many overlook this remote corner of Kyushu, but those who make the effort will discover some of the most undisturbed pawā spotto (spiritual places) in all of Japan. We meet in Fukuoka and quickly head out with a ride along the Chikugo River to an Edo-era town. After climbing up our only significant hill, we descend to the town of Usa and visit a Shinto shrine dating back to 708. Then ride around the conical 731-m high Mt. Futago volcano that has 28 ravines extending from the centre. Cycling around the perimeter allows us to avoid climbing and we can explore the beaches, ports and some hidden temples in the forest. This area is also very rural and known for producing scallions, leeks, tomatoes and prized kabosu limes. Before we leave the peninsula we'll visit the town Kitsuki, often referred to as "little Kyoto" of Kyushu Island. This picturesque town is often used today as backdrops for Japanese movies based in the Edo Period. We'll go to the historic Samurai district and to Kitsuki Castle, the smallest in Japan. We end our tour in one of Japan's top spa destinations, Beppu. Besides luxuriating in an onsen you can also see Beppu's unique hot springs where the water bubbles forth in different manifestations - ruby red water, steamy blue, muddy brown and even a geyser that shoots off about every 35 minutes. Meet in Fukuoka, Japan's sixth-largest city for a welcome dinner and trip briefing. Visit Kyushu National Museum then start cycling in Dazaifu, visiting the shrine and temple before arriving in a hot spring resort and Edo-era mer-chant town of Hida. We change terrain and have a bit of a climb, slowly make our way up to Oishitoge Pass (475 m). But the reward is a terrific downhill to the town of Usa. We climb up Mount Futago. On our way down, we visit one of Japan’s oldest wooden temples. Cycling along beaches and ports, we arrive at our ryokan, with an onsen overlooking the blue sea. We ride inland to avoid busy roads to the town of Kitsuki, with well-preserved samurai districts and Kitsuki Castle. We end our tour in Japan's most famous hot spring resort at Beppu town. Our tour ends after breakfast. The closest airport is Oita Airport if you are departing, return by train to Fukuoka. or you can choose to extend your trip in Beppu. Day 2 - Fukuoka - Dazaifu - Hita Ride 51km. +547m / -516m. 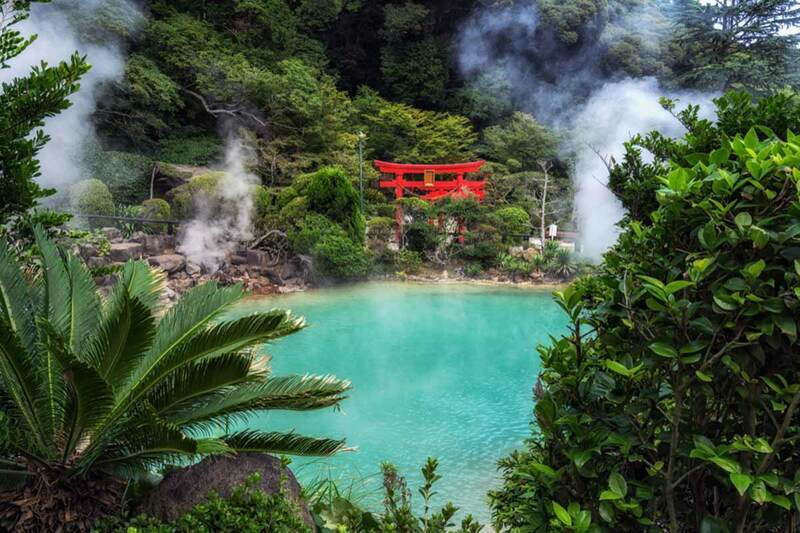 If you love onsens, then this tour is for you! I would like to say that Joe, our other guide, was great! He was funny and upbeat throughout. Visiting and experiencing onsen and sauna after a long day of cycling was one of the most luxurious trip I ever had. The Japanese food and sake was also wonderful especially having them with other fun cyclists. Our guide Eric and Soko was such a pleasure. I highly recommend this trip especially if you like climbing hills! Wonderful route, fabulous hotels and meals, a great cultural insight into Japan. There were many positives to the tour. The choice of hotels was excellent (I loved the onsens), the route was beautiful, the bikes were high quality, and all the meals were delicious and plentiful. The cycling around Kunisaki is moderately challenging with a few climbs. We ride 221 km on quiet roads with amazing views. The first day is flat, the second day has one climb, and the last two days are mildly undulating, meaning they are primary flat, but there may be some rises. Averagely fit cyclists will have no problems. Biking Conditions: This trip is along tarmac roads in good condition, and there is no technical riding. The trip is fully supported; an air-conditioned vehicle follows us for the entire journey. However, it is a point-to-point ride, and cyclists will be encouraged to complete the riding distances. We meet in Fukuoka, the most populous city in Kyushu island and Japan's sixth largest city. Our hotel is very easy to find as it is near the Hakata train station, which is a 6-minute train ride from the airport. We meet you at the hotel for a welcome dinner of traditional food and trip briefing in the evening. After breakfast, we transfer out of buzzing Fukuoka and to Dazaifu where you can visit the Kyushu National Museum and learn about the history of where you'll be cycling. It's then time to get on the bikes and ride by the Tenmangu Shrine and Komyozen-ji, a Zen temple built during the Kamakura period and famous for its stone garden. Then our leisurely riding is along the Chikugo River, our companion today as we cross over it numerous times. A flat and smooth ride will take us to the hot spring resort and Edo-era merchant town of Hita. We explore the merchant pavilions of Mameda Town, once the Crown of the Edo Shogunate before we gather for dinner. Today, we change terrain and have a bit of a climb, a 390-m ascent over 10 km, a nice gradual grade to the top of Oishitoge Pass (475 m). But what goes up, must come down, and we enjoy a terrific downhill to the town of Usa, home to a famous Shinto shrine. The sprawling, wooded, and water-crossed Usa-jingū dates back some 1,200 years and is the chief shrine among some 40,000 in Japan dedicated to the warrior-god Hachiman. The unique Kurehashi Bridge with a thatched roof is particularly picturesque, so be sure to have your camera handy. We begin our circumnavigation of 720-m tall Mount Futago on the Kunisaki Peninsula, which juts out into the Seto Inland Sea. The peninsula is dotted with temples, including many small and rustic ones. Our first stop will be the revered 11th-century Tendai Temple of Fuki-ji in Bungo-takada, the oldest wooden structure in Kyūshū and one of the oldest wooden temples in Japan. Inside the main hall are colourful pictures portraying various themes of the Buddha, indicating the fervent Buddhist worship among the believers at this temple. 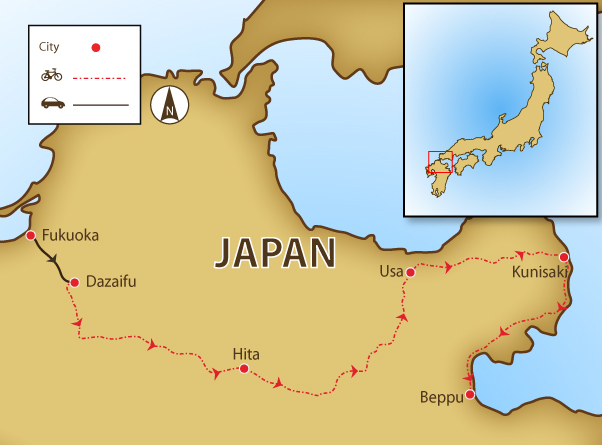 We then back track for a few kilometres and soon find ourselves near the sea, passing beaches, ports, and numerous other shrines on our way to the town of Kunisaki. Enjoy the sea views from the onsen at our hotel tonight. On our way to Beppu, we'll ride inland to avoid the highway, crossing the many streams coming down from Mt. Futago. As we cycle through the town of Kitsuki, we'll see the well-preserved samurai districts and also visit Kitsuki Castle, said to be the smallest castle in Japan. Originally built in 1394, Kitsuki Castle was lost during the Meiji Period but was reconstructed in 1970 and now houses a museum. We end our riding in Beppu, one of Japan's most famous hot spring resorts, producing more hot spring water than any other resorts in the country. It also has a range of baths to enjoy -- ordinary hot water baths, mud baths, sand baths, and steam baths. In addition, the Hells of Beppu are several spectacular hot springs to view, but not to bathe in. Have a hot soak before we have our last dinner together. The bikes are well-known hybrid bikes with lightweight alloy frames, light gears, v-brakes and Shimano components. You're free to bring own pedals, (rail type) seat, and handlebar extensions. If you bring your own bike, please make sure it is in good mechanical order. All nationalities require a valid passport and up to 62 countries have reciprocal visa exemption arrangements allowing nationals from those countries to enter Japan without a visa. Depending on the country, you are allowed to stay in Japan for a certain period of time, which can range from 90 days to six months. Japan has a diverse climate. There are four seasons: from April to June is spring. The rainy season is from middle of June to the middle of July. July through end of September can be hot and humid temperatures in the big cities can go as high as 35 degrees Celsius. Meals are included as per the itinerary where B = breakfast, L = lunch, Most meals will be Japanese seafood; a typical breakfast would include rice, a piece of grilled fish, miso soup. We always carry some granola and Muesli with us for those in need. Dinners will include lots of different seafood - some cooked, some raw. Any special dietary requirements can also be catered for as well. Please let us know at the time of booking. Keeping you completely hydrated is a job we take very seriously. Cold water, some energy-restoring local fruit and soft drinks are included in the tour price while riding. Soft drinks and other beverages during meals are not included. Beer is freely available everywhere in Japan, but is NOT included in the price. We recommend that you tuck away a few extra dollars, perhaps US$30 a day for incidentals. Tipping is not customary in Japan, although our guides have received and accepted tips on a voluntary basis. The currency in Japan is the yen (¥) and is pronounced as ‘en’, with no ‘y’ sound. Though ATMs are everywhere in Japan, it is not always easy to use them as most only work with Japan-issued bank cards and credit cards. The exception is Japan’s post office ATMs which accept cards that belong to the following international networks: Visa, Plus, MasterCard, Maestro, Cirrus American Express and Diners Club cards. In addition to postal ATMs, you will find a few international ATMs in big cities and at the major airports. International cards also work in Citibank Japan ATMs.